The Obama administration "must ... grant American diplomatic recognition to the state of Palestine" before it leaves office, wrote former President Jimmy Carter in a November 28 New York Times op-ed. Lewis Carroll's Through the Looking-Glass and What Alice Found are a great way to understand the Palestinian narrative, and in particular advocates of the Palestinian cause like former President Jimmy Carter. Carroll uses time and space as the plot device while drawing on chess imagery, mirror themes, opposites and time running backwards. This topsy-turvy world provides the perfect "logic" to explain why, according to Carter, in his last days in office President Obama should force the United States through the UN Security Council to recognize a Palestinian state. Carter's voice in the political wilderness is mostly heard in pro-Palestinian circles, and he is seen as someone who's built his post-presidency on practicing foreign affairs without an electoral mandate. Of course, all of this speaks directly to the New York Times political and editorial agenda as it relates to Israeli-Palestinian conflict and American politics, especially now during the transition between Obama and Trump. At every juncture, Arabs and Palestinians have flatly rejected recognizing Jewish rights in favor of war. It is also no coincidence that the Times published Carter on the anniversary of the 69th anniversary of the UN Partition Resolution of 1947 a plan that would have given the Arabs a state, which they chose to reject in favor of waging war on the Jewish state which was in formation. Of course, had the Palestinians and the Arab states simply said yes, then Carter would have nothing to demand from the US or Israel. An honest reading of history would show that at every juncture that involved Arabs and Palestinians recognizing Jewish rights, it was flatly rejected in favor of war. Yet in the house of mirrors where Carter lives only Israel is responsible for Palestinian "misery." Above all, both Carter and Obama have seen the Israeli-Palestinian conflict as central to all Middle East problems; were it resolved then Middle East would see a new golden era of calm. But reality keeps disproving this hypothesis; the collapse of Syria, Iraq and Libya were not linked in any way to Israel, and the so-called "Arab Spring" has shown that the Arab masses are brought into the streets to protest local misrule and lack of opportunity. 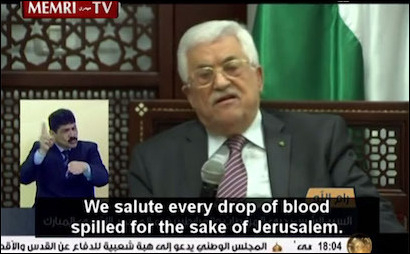 PA president Mahmoud Abbas has voiced incessant anti-Semitic and anti-Israel incitement. While Carter has been motivated by a kind of religious zeal, Obama claims to employ "tough love," which has led to two false assumptions. The first is the "linkage theory," which holds that the key to solving the problems of the Middle East is a resolution of the Palestinian issue. The second is the contention that the Palestinian problem is primarily the Israeli settlements in the West Bank and the status of Jerusalem. In addition, the question of who Israel should be negotiating with is on shaky ground, as the 81-year-old Mahmoud Abbas has consistently refused direct talks with Israel and his support among his own people is questionable. Notwithstanding, Carter like the Palestinians and Arabs loves to quote UN Security Council Resolution 242. It's become the foundation of the land-for-peace formula drafted after the Six Day War, and a superficial reading seemingly places Palestinian and Arabs in a position of strength. For Arabs, this "legal" prerequisite emphasizes the give and take: If Israel valued peace, it would return land. If Arabs wanted land, they would give peace. For Carter, talk - not peace - is all that Israel should expect or deserve in exchange for territorial concessions. Arabs also love to quote Resolution 242 because it is a deceptively simple equation. On one hand, it talks about the exchange of land for peace with Israel, meaning there is room to negotiate. But although we naively believe it also calls for recognition of Israel as the Jewish state, that's not the case. The resolution in fact makes no mention of recognizing Israel. Carter builds on this misreading and claims, "recognition of Palestine and a new Security Council resolution are not radical new measures, but a natural outgrowth of America's support for a two-state solution." Within the house of mirrors anything is acceptable. In fact, American policy makers until Obama have agreed that Israelis and Palestinians must make "mutually agreed upon land swaps" and have agreed not to impose international bodies on the parties. And all along the Palestinian tactic has been to internationalize the conflict in order to avoid direct negotiations with Israel and the hard concessions that would be demanded, then blame Israel for not negotiating. 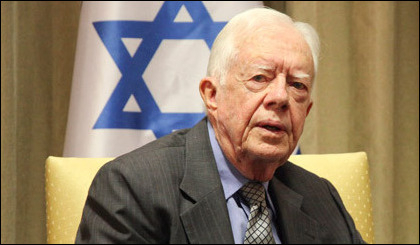 Carter has been using his credential as a former U.S. president to blame Israel for decades. At the end of the day, "land-for-peace" really translates into "land-for-talk." For too many Americans and Europeans, talk - not peace - is all that Israel should expect (and possibly deserve) in exchange for territorial concessions. Asaf Romirowsky is the executive director of Scholars for Peace in the Middle East and a fellow at the Middle East Forum.